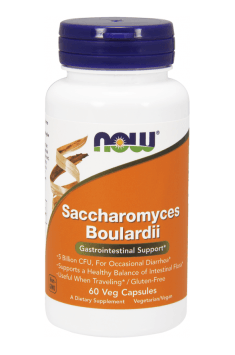 Saccharomyces Boulardii is a one-component dietary supplement which contains probiotic yeasts cultures from Saccharomyces boulardii strain, which show proven effectiveness in fighting the symptoms of diarrhoea of different etiology as well as support the regeneration of intestinal microflora. There are 5 billion CFU of Saccharomyces boulardii in a single capsule. Probiotics are live microorganisms which, according to the World Health Organisation (WHO), applied in proper quantities positively affect the health condition of the host. Next to health-promoting properties, probiotics have to fulfill other criteria, which inlude proven safety of use, resistance to the influence of gastric acid and bile acids, ability to colonise the intestines and actions allowing for the efficient competing for receptors with pathogenic microorganisms. Probiotics can occur both in food (fermented milk products, such as yoghurt, buttermilk or kephir) and in form of preparations containing single strain or complex cultures. Saccharomyces boulardii is a species of non-pathogenic yeast-like fungi. It has been demonstrated that the strain shows anti-microbial and antitoxic properties as well as it affects the bacterial intestinal microflora, metabolism and immunity. The Saccharomyces boulardii strain was isolated in 1920 from fruits, lychee and mangosteen, by a microbiologist Henry Boulard. This microorganism is characterised by an optimal growth temperature (37oC) and it is resistant to the bile acids action and low pH of gastric contents. The action of S. bouardii is multidirectional. There are plenty of mechanisms by which the strain affects the human body system. They include i.a. increase in pathogenic bacteria adhesion to S. boluardii which reduces bacteria adhesion to intestine walls and improves their excretion from the body system; intestinal microflora stabilisation due to the restoration of the short-chain fatty acids synthesis (acetic, propanoic and butyric acids); participation in the production of polyamides responsible for erytrocytes maturation which allows for the production of digestive enzymes. Moreover, S. boluardii plays an important role in supporting the immune system, as it increases the content of the secretory component (SC) and immunoglobulin A (IgA) as well as it stimulates the secretion of the antiinflammatory factor and reduces the synthesis of the proinflammatory cytokine IL-8. Antibiotic treatment, especially those of a wide spectrum of antibacterial action and concerning anaerobic bacteria (i.a. clindamycin and aminopenicillin), can result in diarrhoea caused by the impaired intestinal microflora. According to numerous meta-analyses, the use of probiotics can reduce the risk of diarrhoea by 60%. The strain counteracts diarrhoea both in adults and in children. It has been proven that the use of a probiotic containing S. boluardii in a dose of 0.2–1 g per day during antibiotic treatment can reduce the risk of diarrhoea by 50%. Saccharomyces boulardii produces protease which is able to bind toxins produced by Clostridium difficile which reduce the release of water and sodium ions into the intestines and improves protein digestions, which is why it can reduce the risk of pseudomembranous colitis. The infection with C. difficile is very common during antibiotic treatment and is a cause for 10–20% of diarrhoea. Moreover, it is often a cause for hospital-acquired intestinal infections. Randomised scientific studies have demonstrated that the Saccharomyces boulardii strain is effective in case of patients struggling with recurring diarrhoea caused by the presence of C. difficile. Travellers diarrhoea is to be diagnosed if a patient passes 3 or more liquid or semi-liquid stools a day which are accompanied by at least 1 of the following symptoms: increased body temperature, nausea, vomiting, tenesmus and blood in stool. These symptoms occur in the first 2 weeks of a trip and without any treatment they may last for about 4 days. The most common cause for diarrhoea is bacterial infection caused by i.a. Escherichia Coli strain and the bacteria (Schigella, Salmonella or Camputobacter). Scientific research has demonstrated that S. boulardii can be effective in counteracting travellers diarrhoea. It has been observed that in adults travelling to Africa and tropics, who took S. boulardii before and during the trip the reduction in diarrhoea episodes declined by 20%. To sum it all up, Now Foods Saccharomyces Boulardii is a dietary supplement which effectively complements the diet with a health-promoting Saccharomyces boulardii strain. The product can be particularly useful during antibiotic treatment and in the treatment of recurring diarrhoea of different etiology as well as it is recommended for people travelling to countries where the risk of travellers diarrhoea is quite high. As a dietary supplement, take 1–2 capsules 2–3 times a day when necessary. The product is stable in the room temperature, however to maintain its shelf-life for longer, it can be stored in a fridge. Probiotic products should be taken with a meal or just before it (maximum 30 minutes before). This affects the higher survival rate of bacteria, as a meal has protective and buffering influence on the gastric contents, while a low pH of the gastric contents can damage the capsule casing. In case of antibiotic treatment, you should take a probiotic during it and for at least one week after it. In case of Saccharomyces boulardii strain there is no need for maintaining a time-lapse from antibiotic consumption. Cellulose (capsule), Organic Inulin (FOS) (Fructooligosaccharides) and Guar Gum. Magnesium in the form of magnesium oxide. Helpful in heartburn and constipation, supports the muscle work. Saccharomyces cerevisiae – yeasts from the group of monocellular fungi, commonly used by the researchers as test material, because of its small environment requirements. They are also popular in food industry. The yeasts show health-promoting properties and are a good substitute for offal in vegetarian diet. They are a good source for vitamins, particularly B-vitamins. They have also positive influence on the condition of bacterial microflora, as they improve the functioning of intestinal barrier. In dietary supplements and drugs, they are used mainly as a support for the functioning of the digestive system. They are also present in products improving the quality of skin, hair and nails, however the newest research suggests that the influence on these tissues results from the influence on the microbiota.